So the weekend was fabulous. Actually it's quite something to say that overall my view of the weekend was good since it had quite a few ups & downs. Friday afternoon saw Varen & I in quite a serious argument ... one that saw us canceling our evening's plans to watch Hannibal Rising together. With many an angry word typed on Google Talk and a heated telephone conversation, things did not look good. We worked thru it, well I did ... I'm not the sort of person who can maintain an angry mood for long. I vent, tell you exactly what I think and then move on. Varen doesn't, but I only found that out later. So being that I was fine and he was clearly dangling one of those typical "tests" by saying he was still going to see the movie since he'd bought the tickets on his credit card. So, I figured I'd succumb and surprise him there. Hey, I wanted to see the movie and needed to fix things. Off I went, all the way to Bedford Centre to meet him. And what a waste of time. He acted like I was barely there. And the movie was rubbish too. I did finish the book this weekend (after seeing the movie) and both are fairly boring all round. The movie sticks fairly close to the book ... not exactly, but that's to be expected. Based on the new Hannibal Lecter prequel novel from author Thomas Harris, which centers on how Hannibal watched his young sister get killed and eaten by hungry soldiers in war-ravaged Lithuania during WWII. 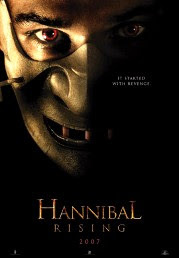 The movie will take place at three pivotal moments of Hannibal's life. It is the fourth book dealing with the Doctor, who first appeared in Red Dragon, and subsequently in The Silence of the Lambs and Hannibal. Then I left and went home. He thought I'd cave again and follow him home, since he lives closer. Wrong. I was angry with him again by this point. Hello, I put in the effort, I should've passed the test by my mere arrival. He wanted to talk (on the cell phone while I was driving home) I told him he'd had his opportunity and I was now driving. Too bad. Little did I know, he followed me home. He arrived shortly after I did and I was fairly surprised, since I knew he was still annoyed. We had a long heated discussion and things ended up fairly resolved ... well as resolved as things can get in an anti-dating relationship, I guess. Saturday was busy. I hit Cresta and did some serious shopping :) I had birthday presents to swap and got some cool new jerseys too. Unfortunately while in the check-out queue at Edgars, mom called me. The Peeb had been to the Rheumatologist on Friday to see if they could find out what was causing all her pain. They found out what it was, she has Psoriatic arthritis. Yes, that's right, at the ripe old age of 24, my sis has been diagnosed with a lifelong condition that is apparently genetic (that's what the doc says). Anyway, I was pretty shaken as you can imagine, but I gave the Peeb a call later in the day and she calmed me down. So far she seems to be fairly upbeat about it and taking it all in her (tiny) stride. Fingers crossed, Peeby! And then I had to go to work for another weekend implementation. That was fairly mundane. After that I went home and relaxed ... it was my weekend, after all! Chatted to Varen on the phone, I needed to talk to someone about the latest news on the Peeb. He suggested possibly going for drinks later, hell yeah I was keen after the day I'd had. Turned out to be just the two of us and we headed off to Cool Runnings (both the Melville & 4Ways one, since Melville no longer offers hubbly's). We had a spectacular evening, which was pleasantly surprising after the previous one. Things seem to be more stable between us, we seem to be able to be more honest about when we do and don't fit into each other's lives. I told him I was trying to get a transfer to London thru work. He told me he was going to Australia on holiday in December. I told him I was trying to go see the Mountain Gorilla's in Uganda later this year. None of these plans involved the other person and we were both fine with that. Sunday evening comprised of more Grey's :) Oooh, and I bought 5 new fish ... very exciting, they seem to be doing well so finger's crossed! Hopefully I'll eventually move a few of them to the outside pond, but in the meantime their all together in the giant bowl in my room and I'm quite enjoying having a "full house".